Cucumber Orange & Mint Salad. | Eat More Plants. I’ve been eating a lot of pizza lately; namely Amy’s roasted veggie pizza which is basically focaccia bread. It’s just so good. It has this roasted onion jammy-sauce on it, artichokes and roasted peppers. Yay for a cheeseless pizza that’s actually delicious, right? So anyway, I’ve been trying to offset my increase of pizza/pasta (been eating a TON of raviolis too – rising moon has a great vegan artichoke & olive ravioli) by eating enormous amounts of salad and fruit. I’m a hungry girl, what can I say? cucumber ribbons/noodles with fresh squeezed orange juice, mint, hemp hearts & sea salt. The combination of orange and salt is so good. 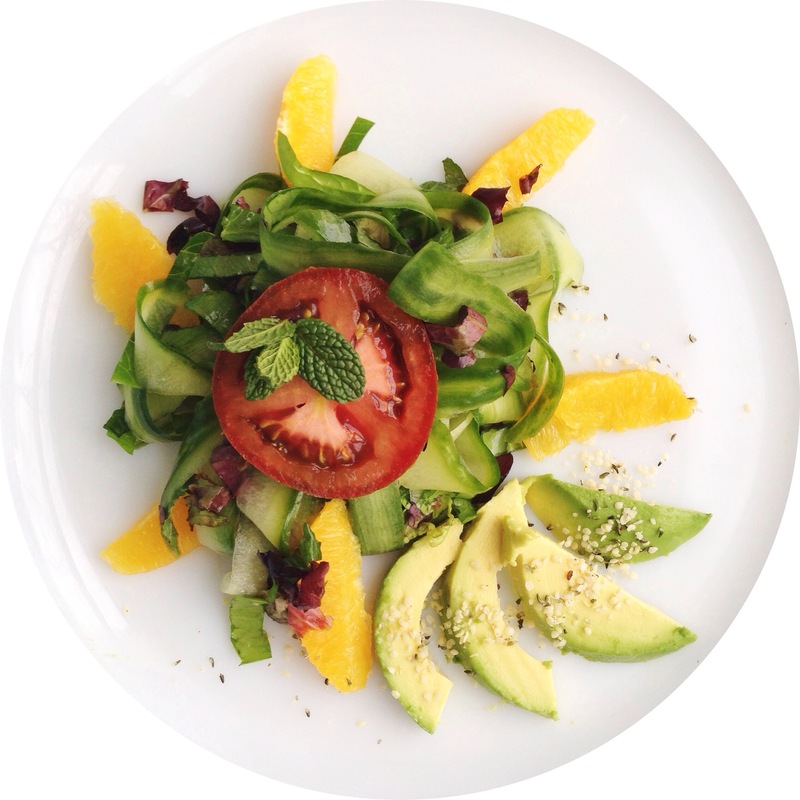 Of course some avocado in there too…and beautiful hydroponic heirloom tomatoes! If you don’t have a spiralizer or a julienne peeler to make skinny noodles out of your cucumbers, zucchinis, carrots, etc…just use a regular veggie peeler and you’ll get the kind of ribbons I did today. Although I highly recommend buying a julienne peeler; they’re about 8 bucks and are soooo worth it. Mine is made by zyliss. Looks delicious! Do you skin you veggies before making the “noodles”, or do you include the skins?